Works best on new and damp snow. Vauhti product development team makes continuous innovations and has improved the FC products to a high level. These products have superb characteristics. They minimize the surface energy of the ski base, making it super-hydrophobic and dirt-repelling. At the same time, they are excellent in cold conditions to reduce dry friction. 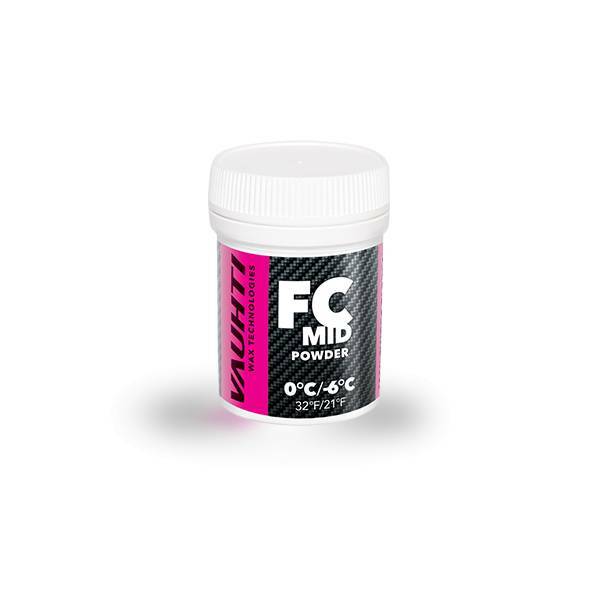 The speed, glide sensitivity, and durability of the FC-powders are excellent in all weather conditions. With versatile application methods every skier will benefit, even the lightweight skiers. • Clean the ski base thoroughly with Vauhti Clean&Glide cleaning and maintenance agent. • Use an UF, HF or LF RACE product suitable for the snow type and humidity as the base wax. • Scrape and brush the base wax layer carefully, start with roster or brass brush and polish with nylon brush. • Iron the powder in by quick (approx. 7-10 sec.) strokes; the iron temperature must be approx. 170 – 180°C. Roto cork the ironed powder surface while still warm, at low drill RPM and light pressure. Only two or three strokes from ski tip to tail are required. • Brush by roto horsehair brush. Continue with roto nylon brush until the surface is even and glossy. o If no roto tools are available, clean natural cork can be used for fixation – rub the surface vigorously and hand brushes for brushing – use a roster brush to open the base and a nylon brush to polish the surfaces. • Iron the powder in using so-called ‘full burn’, in which case the ironing takes for 15 – 20 seconds. The iron temperature should be approx. 170 – 180°C. • Cool the skis thoroughly and carefully scrape away excess powder. • Brush by roto horsehair brush. Continue with roto nylon brush and finalize the surfaces to a slightly matt condition by roto horsehair brush (matt surface is more hydrophobic as compared to glossy one). o When brushing by hand, open the glide surfaces by roster brush; continue with nylon brush and use a horsehair brush or roster brush for the slightly matt surface.